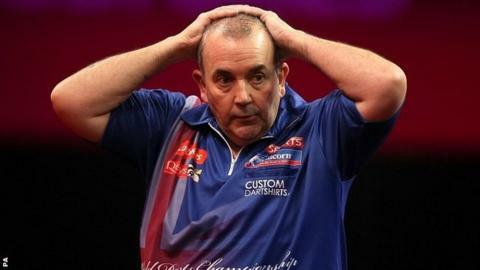 Defending champion Phil Taylor crashed out of the PDC World Championship with a 4-3 defeat by Michael Smith. Smith capitalised on an error-strewn display by 16-time champion Taylor, 53, and produced 11 and 13-dart legs in the decider before finishing on the bull. "I've beaten the best player in the world and my aim now is to put my name on this trophy," said Smith, 23. "I'm confident I can win it now," the world number 32 added after the second-round win over his fellow Englishman. Taylor won the opening leg against the throw with a 156 checkout and did not miss a double throughout the first set. However, his form on the doubles deserted him in the second set, and Smith recovered to level the match after both players went down to double one. After Taylor took a 2-1 lead with victory in the third set, Smith took advantage of more inconsistency to make it 2-2. The world youth champion threw away six darts to allow Taylor to move into a 3-2 lead but the challenger was throwing the more fluent darts and levelled the match to take the game to a decider, before sealing the biggest win of his career. "I'm lost for words," said Smith. "Nobody expected me to win and I had no pressure on me, but I showed I've got fight." "When Phil hit the 156 to win the first leg I thought I was going to get beaten in 12 legs. But he wasn't holding his throw and I had to take my chances, and when I broke him in the second set I believed I could do it." Elsewhere, five-time champion Raymond van Barneveld survived a scare before fighting back to beat Jamie Caven 4-3, and Peter Wright saw off Per Laursen 4-2.